Grand Theft Auto 5 caused a stir when it was released more than a year ago, a stir that's all the more frenzied in its new-gen incarnation on PlayStation 4 and Xbox One. Why? Because now you can experience all the bloodshed, sleaze and profanity throughout its open-world from a first-person perspective. Developers Rockstar Games and Rockstar North have never shied away from the adult stuff though. "Killing good taste wherever we find it" reads a solitary statement the company's website. Although it's not that sentiment which makes GTA5 such a powerful game: it's the engaging characters, the ambition, the abundance of content, the escape from reality, and the downright fun there is to be had. GTA5 knows exactly what it wants to be and never sells itself short. From the social commentary bubbling under the surface, the tongue-in-cheek dialogue, through to the beautifully rendered landscape which often juxtaposes the crimes you play a part in. It's not just gung ho for the sake of it, there's balance in among the madness. And on the new-generation consoles Grand Theft Auto reaches its climactic best. Whether in for this bona fide thrill ride for the first time, or coming back for first-person seconds, it's a storming game that shouldn't be missed - whatever other headlines you read. Here's why. Grand Theft Auto 5 is set in Los Santos, in the California-inspired state of San Andreas, showing more than an echo of real life Los Angeles. Only there are fewer traffic jams in this virtual world and you can actual get around quickly - and often by manically crashing into things. It's a huge open-world that can be explored on foot or by utilising one of many vehicles. Whether on the ground, underwater, or in the skies, there are few limits to the explorative fun. The streets are rich with things to discover (and overhear), side-missions to unlock, and recreational activities to take part in should you so wish. Who wouldn't want to play a round of tennis after blowing someone's brains out, huh? It also looks gorgeous, with enhanced graphics, higher resolution rendering, depth of field effects, and next-gen foliage found out in the sticks too. Not that you're going to be buying the game for the way the leaves rustle in the wind, mind, but it's these little touches that add to the overall richness of the experience. And the gameplay experience is huge. Not only is Grand Theft Auto 5 the biggest game in the series by quite some way, it also relies on three main characters, rather than just the one as per GTA titles of old. These characters fit the traditional mould, in as much as they're male criminals, but are all very different: Franklin is a young mechanic looking to make a fortune; Michael is a retired thief living under witness protection; and Trevor is, well, he's Trevor - a psychotic meth dealer living on a trailer park. Each of the three characters are thoroughly compelling, thanks to great writing, voice acting and animation. On the PS4, the version which we've been playing for review, they look even better than before too. More animation, more detail, just more of the good stuff. You can switch between these three characters (and sometimes others, such as Chop, the dog), which adds a level of strategic depth not seen before in a Grand Theft Auto title. On mission there are necessary switches that need to be made to succeed. Outside of a mission, should you be bored with playing Michael, for example, then you're free to switch things up and see what Franklin or Trevor is up to. You can even make their paths cross and hang out if you want (well, when friends anyway). GTA5's missions are imaginative, bombastic, and, most of all, a lot of fun. So long as you're a-ok with a liberal peppering of the n-word, in among a smattering of pretty much every other swear-word under the sun, then you'll get along just fine. Parents: it's not one for the kiddies, hence the big red Pegi 18 on the front of the box means (the BBFC does not partake in separate UK video game classification any more). One moment you'll be chasing down a gang of bikers, Sons of Anarchy style, the next you'll be getting a haircut and buying a dapper suit so you can slip into Lifeinvader's headquarters and rig a trap for the head honcho. Adding to the multiple characters, there are also multiple ways to work through the key heist missions. You get to choose your path and who works a job with you based on their ability and how much of the take you're willing to cut them in on. On our first playthrough of the game last year we took one set of options, but with this new-gen revisit we've taken the exact opposite choices to keep things fresher. In the jewel heist mission, for example, we decided to "go in dirty" this time around. That meant new preparation missions to track down the goods needed to pull off the task, which was different to what we had experienced before, reinforcing that there's plenty of life in the game second time around. Not only that, playing in first person brings a whole new feel to the game - and one that doesn't feel like it's been thrown in at the last minute as we expected it might. If you're a first-person shooter fan then the controls may feel a little backwards at times - L3 or left trigger isn't run, for example, a common mistake we made time and again, often resulting in punching at thin air - but you'll get used to it. Running while using the right stick to look around is a little jaunty too, and driving is a whole new task to get to grips with. But it's a challenge nonetheless. Taking cover, selecting weapons and shooting feels very natural whichever point of view you happen to take. Shifting from third- to first-person may sound like a small change, but just as it dramatically shifts the impact of written prose, it makes GTA5 feel like a brand new game. Although aiming and shooting while driving is now even harder than before to master. With such perspective you also get to see some of the game's previously unseen details. Cars have full dashboard details, conversations are played out with characters in lip sync, while actions have associated animations. Dropping from a fence into a forward roll is dizzyingly brilliant, for example, while crashing a bike and sliding along the tarmac is more harrowing than before. It also means added offence wherever possible: pick up a street walker and, yep, you get to play out the whole sexual act in more detail than, well, was ever needed. But it'll undoubtedly make people pay attention and dish out an extra load of promotion for the game. That's just one amplification on the subject of women in the game really, with a number of other misogynistic moments that feel infantile. Not that we're surprised: this is a series that has made its name on such principles, often pulling at the social commentary cord to excuse it, but we're not buying that each and every time. Sometimes the game backs itself into a wall by becoming what it parodies. And that's just one thing to throw on the pile of "shockers" elsewhere within the game. Trevor's behaviour is one of the obvious culprits. He's a brilliant character, albeit an utterly insane one, but from the off there are occasions when he veers into sadistic tendencies. There's a torture mission in particular, for example, where you have no choice but to inflict serious pain on someone to extract information. We're not big fans of pulling teeth, and we don't mean that in the precise manner of a dentist either. If you catch our drift. However, the huge, sprawling landscape is undeniably captivating. Whether you find yourself flying over it, parachuting into it, using dirt bikes, cycling, off-roading, launching a jetski over a ramp, rolling a truck over a barrier Terminator 2 style - there are endless possibilities. The moments have an interplay with reality that makes Grand Theft Auto 5 such an engaging game. Sometimes you'll spend 20-minutes wasting money by adding blind to your favourite ride (and then forget to store it in a garage to save it, d'oh), other times you'll just drive around and see what trinkets can be found. Even having played the game for dozens of hours last year, it's got the goods to eat into dozens more hours of our time once again on the new-gen. There are some new additional tweaks for PS4 and Xbox One users too. Added activities, animals, weapons, missions and vehicles are all present - although we're yet to find out what all of those are - alongside an enhanced online experience. Although, for our money, we've never found that GTA Online has the claws to dig in and take hold. Grand Theft Auto 5 on the new-gen consoles is a game that shines like a diamond. Or maybe more blood diamond. Yes it's full of potty-mouthed dialogue and achieves its 18-rating within the first few minutes of screen time, but it's not the shock and awe tactics that the game should be famed for. 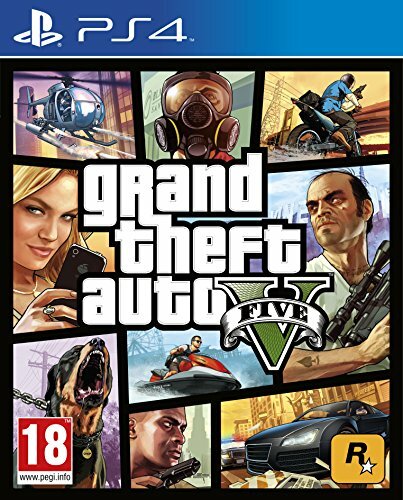 The gorgeous open-world, the freedom to explore, the well-written characters, the madcap missions and (for better of worse) the memorable moments that only a Grand Theft Auto title can pull off. It's all here, condensed into one of the best crafted video game experiences you will ever have. You may have already experienced that last year and be content with your PS3 or 360 playthrough. But with the addition of first-person perspective there's a genuine reason to delve into Los Santos once again on the new-generation and not only relive the experience, but explore its missions in a different way than before. If you're a newcomer then be prepared for a knockout gaming experience. It'll charm, it'll amuse, it might even offend - but it'll keep you coming back for more and more. There's truth to that testament now more than ever: Grand Theft Auto 5 may be over a year old, but the new-gen re-rub shows why it's an epic game that will stand the test of time.